The text in its present form was reconstituted from fragmentary records in Kenchoji and other temples in Kamakura by Imai Fukuzan, a great scholar of Zen in the early part of this century. He was joint author, with Nakagawa Shuan, of a standard reference book of Zen phrases, Zengo-jii- Imai was himself a veteran Zen practitioner, as had been his father before him, and he knew personally many of the great figures of Zen at the end of the nineteenth and the first quarter of the twentieth century. In the small edition (500 copies) of the Shonan Kattoroku collection which he published in 1925, he put a number of notes of his own, and I have translated most of these along with the koans to which they refer. His Introduction to the text is put here at the beginning, along with extracts from his Introduction to a much longer work, to have been called Warrior Zen, of which this was to have been only the first part. That work was never completed, and much of the Introduction consists of long lists of Zen masters at the Imperial palace, with feudal lords, or teaching warriors in various parts of the country. However, there are some references to the present text, and these I have translated, along with a few personal details which he gives. Imai was one of the few scholars who studied Zen at the time, and the last to examine in depth the Kenchoji records before they were almost entirely destroyed in the earthquake in 1924. His studies are therefore of great interest and importance for the history of Zen in Japan. Imai’s book is now rare. Inouye Tetsujiro republished it as one item in volume 7 of his Bushido Zensbii, in 1942; this is also now rare. Inouye added a few notes of his own, which I have occasionally translated. Many of the samurai whose interviews are recorded here were what was called Nyudo (entering the Way), which meant that they had taken Buddhist vows and shaved their heads, though without leaving their families as a priest had to do. According to Imai’s researches, there were 365 names of warriors listed in the Kamakura records as having taken these vows, but Zen interviews are recorded of only 172. There are a number of koan interviews with women recorded, mostly but not entirely from the warrior class. The samurai women were famous for their strength of character, and for moral strictness. The women teachers developed a number of koans of their own (see for instance No. 30). The warrior pupils of the early period of Kamakura Zen had no bent for scholarship and could not be taught by means of the classical koans from the Chinese records of the patriarchs. The Zen teachers of the time trained them by making up koans on the spot, in what came to be called shikin Zen or on-the-instant Zen. Zen master Daikaku’s One-robe Zen (No. 6) and its variant, Bukko’s Loincloth Zen, are examples. It is the spring that becomes the seed of the blossoms. This was translated and accepted by Master Gottan. Imai adds that this gives a good idea of the old Kamakura Zen. Zen adapted to the pupil (ki-en Zen). Scriptural Zen derives from Eisai, founder of Jufukuji in Kamakura in 1215, and of Kenninji in Kyoto. But at that time it was rare to find in Kamakura any samurai who had literary attainments, so that the classical koans from Chinese records of patriarchs could hardly be given to them. The teacher therefore selected passages from various sutras for the warriors, and for monks also. These specially devised scriptural Zen koans used by Eisai at Kamakura numbered only eighteen, and so the commentary to the Sorinzakki calls Jufukuji ‘temple of the eighteen diamond koans’. However, after Eisai, his successors in Kamakura of the Oryu line (to which he belonged – the founder died in China in 1069 and the line was dying out there when it was brought across by Eisai) soon brought them up to one hundred scriptural koans, to meet the various temperaments and attainments of their pupils. These successors were Gyoyu, Zoso, and Jakuan at Jufukuji; Daiei, Koho, Myoo at Zenkoji; Sozan, Gakko at Manjuji, and others. Among these augmented scriptural koans were passages from the sutras but also from the sayings of the patriarchs, to suit the depth or shallowness of comprehension of pupils, whether monks or laymen. Thus the warriors who applied for Zen training in Kamakura in the early days studied both the Buddha Zen (nyorai Zen) and the patriarchal Zen, but it can be said that those who were given classical koans from the Hekiganshu or Mumonkan and so on would have been extremely few. From the end of the sixteenth century, however, the teachers did begin to rely mainly on stories from the records of the patriarchs, for training both monks and laymen. Kamakura Zen now gradually deteriorated, and by about 1630 no printed text of the Shonankattoroku existed, but only manuscript copies. 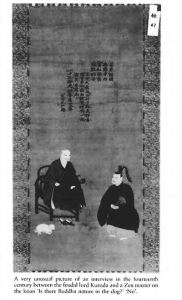 Some time towards the end of the seventeenth century, a priest named Toan in Izumi selected ninety-five of the (Kamakura) scriptural koans, and got a friend, a priest named Soji, to have them printed as a two- volume work entitled Kyojokoanshu (anthology of scriptural koans). These ninety-five correspond to the Kamakura scriptural koans, though with five missing (two from the Diamond Sutra, one from the Kegon Sutra, one from the Lotus Sutra and one from the Heart Sutra). This book still existed in 1925. On-the-instant Zen (shikin-Zen, sometimes read sokkon- Zen) arose from the training of warriors by Daikaku, first teacher at Kenchoji. He had come to Japan in 1246, and had been briefly at Enkakuji of Hakata city in Kyushu, and then at Kyoto; while his Japanese was still imperfect, and without taking time to improve it, he came to Kamakura. Thus this teacher had to be sparing of words, and in training pupils he did not present them with classical koans about Chinese patriarchs which would have required long explanations of the history and circumstances of the foreign country; instead he made koans then and there on the instant, and set them to the warriors as a means to give them the essential first glimpse. Bukko Kokushi, founder of Enkakuji, arriving in Japan on the last day of the sixth month of 1280, came to Kamakura in the autumn of the same year, so that he too had no time to learn Japanese but began meeting people straight away. He also had to confine himself to speaking only as necessary, and in the same way made koans for his warrior pupils on the spur of the moment. Thus at both these great temples there was what was called ‘shikin’ or on-the-instant Zen. Before Daikaku came to Japan, something of the true patriarchal Zen had been introduced by such great Zen figures as Dogen and Shoichi (Bennen), but monks and laymen were mostly not equal to it and many missed the main point in a maze of words and phrases. Consequently Bukko finally gave up the use of classical koans for Zen aspirants who came to him in Kamakura, and made them absorb themselves in things directly concerning them. The Regent Tokimune himself was one of the early pupils in this on-the- instant Zen, and he was one who grasped its essence. Zen adapted to the pupil meant, at Kamakura, making a koan out of some incident or circumstance with which a monk or layman was familiar, and putting test questions (satsumon) to wrestle with. It would have been very difficult for the Kamakura warriors, with their little learning, to throw themselves at the outset right into the old koan incidents in the records of the patriarchs. So in the Zen temples of Kamakura and of eastern Japan generally, the style was that only when their Zen had progressed somewhat did they come under the hammer of one of the classical koans. Among the old manuscript books in Kanazawa and Nirayama libraries there are many concerning Kamakura Zen, for instance Nyudosanzenki, Gosannyudoshu and so on. But it is only the Shonankattoroku which has a commentary with details of when each koan began to be used as such, and in which temple, and also discourses and sermons on them. In the tenth month of 1543, a great Zen convention was held at Meigetsuin as part of the memorial service, on the 150th anniversary of the death of Lord Uesugi Norikata, its founder. Five hundred printed copies of the Shonankattoroku were distributed to those attending. The book included sermons on the koans by Muin, the roshi of Zenkoji. The work consisted of a hundred koan stories selected from Gosannyudoshu and other texts, by Muin Roshi, as particularly suited to the warriors whom he was training at the time. With the decline of Kamakura Zen at the end of the sixteenth century, the copies of this book disappeared and it became extremely difficult to find one. What remained in the temples were almost entirely manuscript copies. In 1918 I examined the old records at Kenchoji in the four repositories of the sub-temples of Tengen, Ryuho, Hoju and Sairai, and among the stacks of old books there were some seventeenth-century manuscript copies of the Shonankattoroku, but all had pages missing from the ravages of worms, and it was barely possible to confirm from part of the contents that they had all been copies of one and the same book. In the first years of Meiji, Yamaoka Tesshu was given a copy by the Zen priest Shojo of Ryutaku temple in Izu, and he allowed Imai Kido to make a further copy of it. In this way I came into touch with a copy, but this was lent and re-lent, and finally became impossible to trace. There are some collections of notes of laymen who were set some of these koans at Kamakura temples, but the teachers when they gave one did not say what number it was, and so in these notes the koans are not tabulated. It was only after finding a list of contents in one of the Kenchoji manuscripts that I was able to determine the order of the full hundred koans as recorded in the present work. In Kamakura Zen there were thirty other koans used mainly by teachers of the Oryu line (mostly at Jufukuji, Zenkoji, and Manjuji – temples traditionally connected with Eisai), which are from Bukedoshinshu (thirteenth volume at Zenkoji), Bushosodan (eleventh volume at Jufukuji), and Sorinzakki (fifteenth volume at Kenchoji), but I have omitted these and present here only the hundred koans of Shonankattoroku. Zen tests (sassho) differ with the teacher. Those given to those trained at Enkakuji in the Soryukutsu (blue dragon cave) interview room of Master Kosen (one of the greatest Meiji roshis) were exceptional tests, and again the tests set by Shunno of Nanzenji, and the formidable Sekisoken tests were not the same. The teachers Keichu and Shinjo had tests of their own. The sassho included here have been taken from a collection of 460 Kamakura sassho recorded in the Tesshiroku (fourth volume in the manuscript copy). These of course have themselves been picked out from many different interviews with different pupils, but I believe they would have been tests devised by teachers when each koan was first being set as such; so the collection will have come from something over a hundred different teachers. Of course sometimes a single teacher devised more than one koan, but if we reckon that Kamakura teachers made 130 koans, we can take it that the sassho tests devised at the initiation of the separate koans would have come from over 100 teachers. The Shonankattoroku koans had sermons and discourses with them as well as a note as to the origination of each one, but here only this last is included. The discourses and sermons are so full of old Kamakura words and expressions that annotations would come to be as long as the original text. Some tests required a ‘comment’ (chakugo or jakugo). In general these are kept secret and not to be disclosed, but as an example I have included some of the comments on the Mirror Zen poems used at Tokeiji. At the end of the sixteenth century Kamakura Zen was gradually deteriorating, and when with the Tokugawa era the country entered a long period of peace, warriors were no longer required to confront the issue of life and death on the battlefield. And it was perhaps for this reason that the quality of those who entered Kamakura Zen was not heroic like that of the old warriors, and both priests and lay followers became fewer. Kamakura Zen begins with ‘one word’ and ends with absorption in ‘one Katzu!’ Its main koan is the Katzu! and unless one could display Zen action at the turning-point of life and death, he was not passed through. Sometimes a naked sword was at the centre of the interview (in later centuries represented by a fan). Kamakura Zen was for those who might be called upon to die at any moment, and both teacher and pupils had to have tremendous spirit. Today those who with their feeble power of meditation, casually entertain visions of passing through many koans, cannot undertake it. In that Zen there were those who spent over ten long years to pass one single koan (for instance Tsuchiya Daian or Matsui Ryozen); how many years of painful struggle those like Kido took to pass through the ‘one word’ koans of Kamakura Zen! These days people seem to expect to pass through dozens of koans in a year, and it cannot be called the same thing at all. Perhaps it might seem pointless to bring out this text now. After the passing of Master Shinjo, there are no more teachers who use Kamakura Zen koans in their interviews, and again laymen who have actually come under the hammer of this Zen now number only nine, all of them in their seventies or eighties. It is to prevent it falling into untimely oblivion that I bring out this work, so that the fragments which Shunpo Roshi left shall not be entirely wasted. The old manuscripts stocked since 1919 in the Dokai-in repository of Kenchoji were taken out and aired on 1 September 1924, and in the great earthquake more than half of them were destroyed. The records of warrior Zen in particular, held under the collapsed building, became drenched with rainwater and entirely ruined. Thus it has become impossible to make a critical collation of the records, but fortunately from the hundreds of extracts already made, and annotated over many years, it has been possible to investigate Kamakura Zen and to bring out this collection of a hundred koans properly edited. Some of the detail had to be determined by comparing as well as possible with what remained of the documents ruined by the earthquake, referring back also to the very many notes which I had myself taken earlier. Since the earthquake, I have lived the Zen life, for a time in a retreat in Kyushu, and now buried in my books at Sofukuji temple. What remained from the earthquake has had to be left. But with my old sick body, it has been impossible to complete the full study of Kamakura Zen quickly, so first of all the full text of just the Shonankattoroku is to be brought out. In the autumn of 1919 I received from Mr Nakayama Takahisa (Ikkan) all the notes about warrior Zen left by the late Shunpo, roshi of Daitokuji, and to help me with these I examined the old records in the repositories of the Kamakura temples. At that time thanks to the kindness of the kancho of Kenchoji, the old records of the Donge room were moved to the study in my lodgings there, so that I was able to examine the records of Zen of old masters of many different periods. Again I must express gratitude for the co-operation of Zen master Kananawa, head of the sect administration, thanks to which my examination of documents and records from their stock of rare manuscripts was made so fruitful. Also I was permitted by the priests in charge to go over the records preserved in the repositories of Jufuku, Butsunichi, Garyu and Hoju temples, which provided some precious material on old Zen. Now by good fortune the manuscript of Shonankattoroku is ready for publication, and I wish to set down my deepest gratitude and appreciation in regard to all those who have helped so much in the task. Regent Tokiyori founded the great temple of Kenchoji for the teaching of Buddhism, but the temple soon could not accommodate all the many warriors who became students (nyudo) in order to enter the Buddhist path and give all their free time to it. So in the first year of Koan (1278) Tokimune, Tokiyori’s son, decided to build another great temple, and invited priest Rankei (afterwards Daikaku) to choose the Brahma-ground, as the site for a temple is called. Teacher and regent walked together round the nearby hills, and found the ruins of a Shingon temple (of the mantra sect) where Minamoto Yoshiyori had once set up a pagoda of Perfect Realization. They decided on this as the place to plant the banner of the Law. First the teacher performed a purification, and made three strokes with a mattock; then the regent made three strokes, and planted a stalk of grass to mark the spirit of faith. In the winter of the same year, when Tokimune was having the area prepared for the foundations, a buried stone coffer was found. In it was a perfect circular mirror; engraved on the back were the words EN KAKU — Perfect Realization. So the temple was called Enkakuji. (2) Beneath the feet of the man of the Way, as he walks, is the Brahma-ground for the temple. At this instant, try building the pagoda of Perfect Realization. This incident became a koan in Kamakura Zen at the interviews of Butsuju, the 21st teacher at Enkakuji. (1) What did Daikaku really mean by saying that the god trod on the pines and so they became bowed? (2) Right now the god Hachiman is treading on this old back as he comes to ask about the dharma, and so my back is bowed. O monks of the congregation, do you know how to hear the dharma in your spiritual experience? This incident became a koan in Kamakura Zen from the time of the interviews of Nanzan, the 20th teacher at Kenchoji.